Cape Animal Welfare Forum (CAWF) is a newly formed organisation that represents all animal rescues in the Western Cape. This group of dedicated leaders from various animal rescue organisations and chaired by Veronica Nel from African Tails, recently had another meeting at the boardroom of Animal Rescue Organisation. One of the topics of discussion on Friday 2 September 2016 was the local city pound – Atlantis Pound. Animal Pounds are a much needed public service, and this one is owned and managed by City of Cape Town’s Law Enforcement Unit. A group of volunteers have embarked on a project to help dogs that have been impounded to this facility. Their findings left them with many sleepless nights and they knew that they had to urgently do something about it. Rescue Rehab South Africa is the new kid on the block when it comes to animal welfare, but they have a different approach – it is a people focus approach. Their aim is to help the people in animal welfare organisations with whatever it is that they needed to maintain and function optimally in their various communities. Whist doing research and finalising their business plan, in early April 2016 they stumbled upon the local animal pound for the City of Cape Town. To their disbelief, they realised that this is not an animal rescue or shelter like most of us are all familiar with. It is in fact a dog prison. When a dog goes in there, he will never be allowed to see his owner for visits, he will not be taken out for sunlight and some running, and there is zero stimulation for the animal whatsoever. All they get is a shelter, food and water, and a hosepipe rinse of the kennel daily. On this day in April, they noticed that some dogs in these 18 kennels were in there for over a year, one was blind and one even had her three puppies inside this 2x2m dark, wet, smelly kennels. How can these incarcerated animals be helped? The Rescue Rehab SA Team set out to share their findings with their local Cape of Good Hope SPCA, who in turn shared their concern with the City of Cape Town. RRSA received instructions from the good man Alderman JP Smith to please start a ‘Friends of the Pound’ and help to try and get this place in order. The team, lead by RRSA founding members Ronel de Villiers and Dave Thorpe, set up systems, invited volunteers to join them and started a weekly FOTP outreach program to visit these dogs and pound staff once a week. These amazing volunteers came from far and wide, walked, loved and cared for the dogs, they updated the records for each dog, gave detailed reports on their health and started to build a relationship with the pound staff to try and help facilitate this facility. As local animal welfare organisations heard of their mission, many key individuals were interested to support this project and some even joined them for the weekly pound visits, word spread fast and Rescue Rehab was invited to present their findings to the local Cape Animal Welfare Forum (CAWF). The presentation was based on their biggest concern for the state of the kennels, the fact that these dogs receive zero human touch or see any sunlight, animal husbandry skills training is needed as well as the fact that the Docket Cases take far too long to be resolved with a court outcome, causing unnecessary prolonged stays of 6 months and longer. 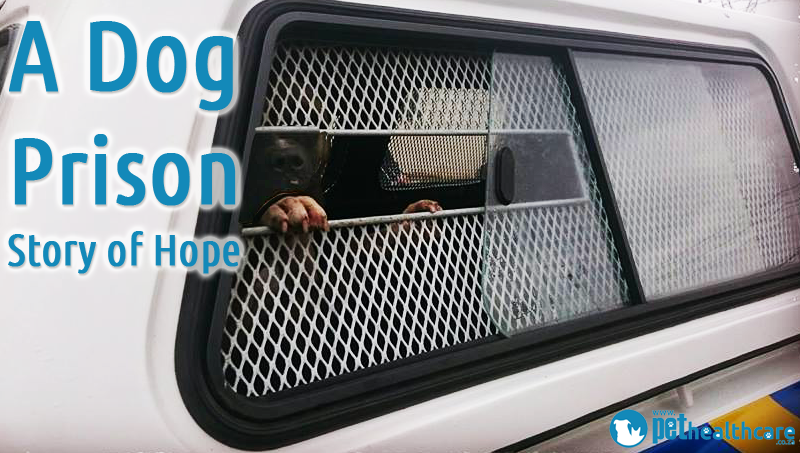 Friends of the Pound South Africa are now working very hard with Cape of Good Hope SPCA to resolve this management system, hoping that they can eliminate the plight of the incarcerated dogs. “There is hope!“, says Team RRSA, as their aim is to hopefully have the dogs moved to a more appropriate venue, where they will be exposed to decent animal husbandry and proper veterinary care. They plan on building a system that will represent the dogs during their legal battles (aka FOTP DogSquad), a program for both the victim and the dog owners, with the aim to speed up the final outcome for what is known as “Docket Case Dogs”. It will not always be a rosy picture in the end, because these dogs are all impounded for dog fights, dog attacks on other animals such as pets and livestock as well as human attacks. The sad part is that many of these dogs are victims of their own surroundings, such as being teased, abused, or left with little shelter and appropriate care having to often fend for themselves. Each case is different and this is why each case will be treated with its own merits too. Rescue Rehab SA – who is the management body for Friends of the Pound are working on a Best Practice model for all animal pounds in South Africa. They would like to encourage you to take note and become aware that animal jails do exist, and without an organisation such as this and their dedicated group of volunteers, those animals will continue to be forgotten. There is a new kid on the block and we are proud to share with you their adventures and crossing fingers for better Animal Pound management systems in South Africa. Rescue Rehab South Africa is growing and are building their team. You are welcome to contact Ronel or Dave, should you wish to join their volunteer team around South Africa.